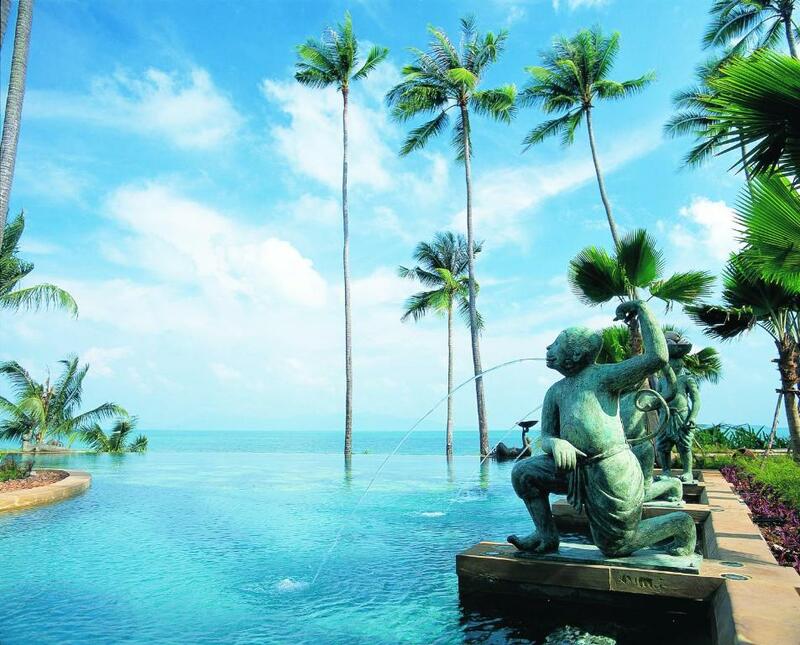 Lock in a great price for Anantara Bophut Koh Samui Resort – rated 8.8 by recent guests! The hotel has beautiful settings in a lush tropical garden. The spa facilities are great and treatments/ massages are very good. The beach is not a loud and busy as Chaweng and the hotel has great facilities (incl. free paddleboard). Pool is nice as well. In the evening the resort is quiet (no parties, no loud music) but Chaweng is just 10 min drive away and Fishermens Village is a 5 minutes walk, so if guests want to go out for drinks/ dinner it is very convenient. the service is amazing the stuff are great the rooms are big, clean and treated twice a day. what i like the most is the service which was the best. every request was treated immediately with zero waiting time. The pool was nice, but there was no hot tub. The room was dark & the mattress was very hard/uncomfortable. It would be better to stay at the hotel next door as all rooms in that hotel had a really nice view of the water. Anantara Bophut Koh Samui Resort This rating is a reflection of how the property compares to the industry standard when it comes to price, facilities and services available. It's based on a self-evaluation by the property. Use this rating to help choose your stay! One of our top picks in Bophut.Set on Bophut Beach, Anantara Bophut Koh Samui Resort offers tropical getaways with tastefully furnished rooms set in landscaped grounds. It features a spa pool and 5-star fitness facilities. Featuring Southern Thai décor, spacious rooms boast a private balcony with a lounge area and scenic views. Luxurious bathrooms open into the room and have a bathtub for 2 people. Anantara Bophut Koh Samui Resort is a 10-minute drive from Chaweng Beach and a 15-minute drive from Samui Airport. Car hire and airport shuttle services are available. Guests can pamper themselves with a soothing massage at Anantara Spa or enjoy water sports and sunset cruises at Bophut Bay. Yoga and craft classes are also available. Featuring 8 food and beverage options, dining highlights include Italian specialties at Full Moon. Free WiFi is provided at select bars and the library. This property also has one of the top-rated locations in Bophut! Guests are happier about it compared to other properties in the area. 뀐 Located in the top-rated area in Bophut, this property has an excellent location score of 9.0! When would you like to stay at Anantara Bophut Koh Samui Resort? Air-conditioned room features a balcony with garden view, a flat-screen cable/satellite TV and DVD player. It has a mini-bar and safety deposit box. Shower facilities are included in an private bathroom. Larger than Premier room, this air-conditioned room features a balcony with view of the grounds, a flat-screen cable/satellite TV and DVD player. It has a minibar and safe. Shower facilities are included in a private bathroom. Larger than Premier room, this air-conditioned room features a balcony with sea view, a flat-screen cable/satellite TV and DVD player. It has a minibar and safe. Shower facilities are included in a private bathroom. Suite features a balcony with garden view, a flat-screen cable/satellite TV and DVD player. It has a mini-bar and safety deposit box. A bathtub is included in an private bathroom. Larger than Junior Garden View Suite, the suite features a balcony with garden view, a flat-screen cable/satellite TV and DVD player. It has a mini-bar and safety deposit box. A bathtub is included in an private bathroom. Spacious suite features a balcony with sea view, a flat-screen cable/satellite TV and DVD player. It has a mini-bar and safety deposit box. A bathtub is included in an private bathroom. Suite features access to the garden and pool. This suite has a balcony, mini-bar and DVD player. Our property has a great team that delivers signature Thai hospitality. We are located within walking distance of Fisherman’s Village and feature or award winning Anantara Spa as well as our Full Moon Char Grill signature restaurant. House Rules Anantara Bophut Koh Samui Resort takes special requests – add in the next step! Anantara Bophut Koh Samui Resort accepts these cards and reserves the right to temporarily hold an amount prior to arrival. For bookings made from 3 January 2019 onwards, a compulsory Gala Dinner is included in the room rates of 31 December 2019. The rates of the Gala Dinner are based on room type and occupancy (guests sleeping in extra bed will be charged separately). Please note that the name of the credit card holder must be the same as the guest’s name and credit card must be presented to the hotel upon arrival. In the case that guests fail to present their credit cards, guests will be required to settle a new payment upon check-in. Excellent all round, fantastic staff! I felt the hotel was a tad ‘tired’ in certain places. The spa and children’s club especially so. The fact that hotel residents are charged to use the steam room is rather strange! Whilst staying there there were workmen touching up bits of paintwork.....I feel a refurbishment is due. We didn't like the beach, as it was just a small strip of sand, not very enjoyable. It was cool that they had some big beanbags at the beach, but the beach itself wasn't very inviting, and most people just stuck to the pool area. The inroom dining was ok, but the menu was lacking choices, especially for vegetarians. We didn't try the inhouse restaurant. Our biggest issue with the hotel was the balcony. It was not broken or dirty or something by any means. It was nice looking and the overhanging seating area was a really nice idea. We even had a view on the beach. But the issue was mainly with the roof. We stayed in the hotel in december, which is still in rain season. We knew this but it didn't bother us to book. Rain in this warm weather is nice and enjoyable ... if you had a proper balcony that you could use when it rains. We had this in other hotels on koh samui as well. You can sit outside on the balcony with a cocktail and read a book or just chill. But that is not possible in Anantara. The problem was, the roof was, due to it's design, not covering the whole balcony. And as soon as it started to rain, the whole balcony was getting wet. And I mean the WHOLE balcony. There was no use in hanging wet swimsuits to dry or sitting anywhere outside. It was just not useable at all. This fact alone would be enough for us not to book it again. And if we knew it in advance, we would have booked a different hotel. There is no sense in having a nice room with a balcony that you can't use during rain season. It might not be as much of an issue during the dry season, I see that. But if you book during rain season, be prepared not to use the balcony at all. The location was nice, it was very close to the fisherman's village with a lot of restaurants and shops. The close by night market was also good. The hotel was beautiful and well kept, the room service was really good and it was an overall beautiful resort. So what you would expect from a 5 star hotel. The breakfast was really nice. I liked the variety and the breakfast staff was awesome. Room was full of humidity and smelled like mold. I could hardly sleep. The restaurants food was not at the level of a 5 star hotel. The staffs english is not good, they could hardly communicate with us. The hotel staff is not really customer oriented. We had to go to the hospital and they didn’t even call a taxi for us. We had to do it. The hotel as structured is nice but nothing of its services is 5 star. Would def not go back. Excellent facility with great staff. We enjoyed every minute. It is located close to fisherman's village so you are not stuck at the property. My son (9 years old) had Thaibox lesson every day. Special thanks to Thai Box instructor Mr.Moon. We will come back next year. Beautiful facility with first rate and extremely helpful and friendly staff who simply could not do enough. A fantastic experience. Very well located, next to Fisherman Village and the the beach. Lovely staff, dreamy spa.